Are you following Oh Six Eleven on Facebook yet? Located in Toronto's Financial District is one of the most beautifully designed restaurants I have been to. From the green leather armchair stools lining the curved marble topped bar, to the geometric floor and black steel-framed windows, there is little about Drake One Fifty's post-modern design and jewelled tones that doesn't grab your attention as you enter the restaurant. We all know I love an aesthetically pleasing place to eat, and when it came to decor, this ticked all the right boxes. Drake One Fifty's brunch menu has a good mix of sweet and savoury options, from their french toast and cinnamon rolls to the Drake breakfast and a chicken wrap. I opted for savoury on this occasion and had their Western Omelette; red pepper sofrito, pine nut emulsion, spinach, manchego, served with prosciutto crostini. I also couldn't resist a side of bacon, which there was quite a lot of for the equivalent of £2.30! The omelette, whilst not something I would usually choose in a restaurant, was divine, and the bacon was so good, perfectly crispy, I would have quite happily ordered a second portion. Serving brunch on a Saturday and Sunday, I can think of few places that I would rather spend my time catching up with friends over a delicious plate of food and a really good cup of coffee, than Drake One Fifty. You can follow The Drake on Instagram here! With striking yellow doors on King Street enticing you in for brunch on a Sunday morning, I was half expecting to see a lot of vivid colours upon entering Weslodge, but we were met with a palette of gloss black and rich purple. Mixing luxurious finishes with authentic saloon inspired decor, most of the restaurant's design is quite dark, but the large windows, white saloon-style cabinets and mix of marble and wooden topped tables make the space feel more inviting and the perfect place to indulge in not just brunch, but a cocktail or two as well. I opted for one of my all-time favourite brunch dishes; Eggs Benedict. Served with spinach, hollandaise and a side of breakfast potatoes, upon a black pepper biscuit (sort of like a scone for us UK folk), this was just the fuel I needed before a busy day exploring. The eggs were cooked to perfection, and the sauce to egg ratio was just right. I enjoyed having the biscuit, rather than your usual breakfast muffin, with the eggs. The texture was much nicer and the kick of the black pepper complimented the eggs and hollandaise really well. I loved the simplicity of the food and coffee at Weslodge; they know the power of getting a classic brunch dish just right, rather than trying to out-do their peers with complex recipes and ingredients. 10/10 would recommend. Find Weslodge on Instagram here! Check out my Toronto Photo Diary here! After saying "adios motherfxckers!" to my school one month in to my second year of A-Levels, I never did plan on going back, but I was more than happy to make the exception after my friend Abi (Travel Tea TV) sent me School's Instagram prior to me arriving in Toronto. The food looked right up my street and I knew if I was going to have a sweet brunch whilst in Toronto, it had to be here. School has an effortlessly casual industrial yet cosy vibe; brick walls mixed with lots of black and metal, clever touches that nod to that long-forgotten classroom - a blackboard with illustrations of different school subjects, red apples on each of the tables, and a whole wall of clocks set to "schools out" 3 o'clock. I chose to have their Black'n'Blue Flapjacks - the fluffiest stack of pancakes piled high with blueberries and blackberries, served with brown sugar butter, whipped cream and pure maple syrup, dusted with icing sugar. These were ridiculously delicious, I might go as far as saying the best pancakes I have ever had! Perfectly light pancakes, just the right amount of fruit and sauce, and of course my new-found favourite maple syrup, I can see why the flapjacks are such a popular choice. If you are after the ultimate comfort food on any given morning, head to School for the best brunch. This was my favourite brunch that we had and I can guarantee you will not be disappointed! For the brunch photos of dreams, follow School on Instagram here! Taking inspiration from Mediterranean cuisine, Cafe Landwer's brunch is a little different to the other three restaurants featured in this post. I loved the retro decor, with the neon "Start your day with Landwer" being a standout against the wood panelling, and the red and white check paper napkins reminding me of holidays in Italy. On a freezing cold January day, I chose to warm up with their Mediterranean Shakshuka; two poached eggs in a spiced tomato sauce, topped with feta cheese, roasted aubergine and parsley, served with a generous portion of fresh bread, tahini and labneh dips, and a salad. It's a lot of food and you might struggle to finish it all, as we did, but it is delicious and makes a nice change to the usual fry up or waffles! The service here was exceptional, and even on a busy morning, the team effortlessly cleared plates, brought over coffees and topped up our water. For a brunch that is a little different, but equally as warming and filling, I couldn't recommend Cafe Landwer enough. Check out Cafe Landwer on Instagram here! Have you been to Toronto? Where's your favourite brunch spot? Oh wow! I love a good brunch, and these all sound amazing! I haven't been to Toronto before, but a friend of mine is moving there, so I know where I will be going if I get the chance to visit her. Like you I think I would try a few different ones, both sweet and savoury options. I'm quite intrigued by the Mediterranean one. This is making me so hungry! I need those blueberry pancakes - yum! I would love to visit Canada sometime. OMG now I am hungry haha.. yum! The food scene in Toronto looks amazing! I'm always looking for more foodie places to travel to and I think I'm going to add this to my list. Brunch is my favorite kind of meal! Pinned this! 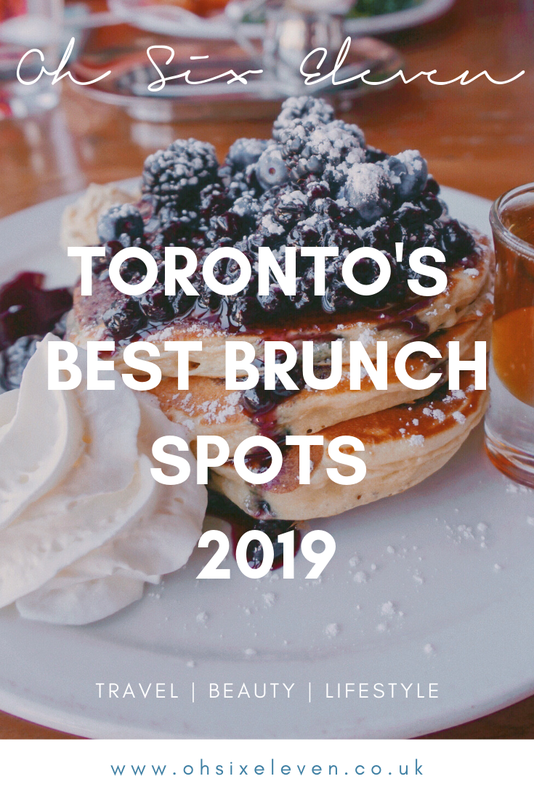 We're likely heading to Toronto for a long weekend in March and all of these spots look AMAZING! Toronto is a city I've wanted to visit for years. I've met quite a few people from there and heard so much about it. I'm definitely looking forward to brunch there when I make it over! Mmmmm those pancakes and eggs benedict look amazing! I really need to visit Toronto and Canada definitely! Reading this post made me hungry! Your photos are absolutely stunning!